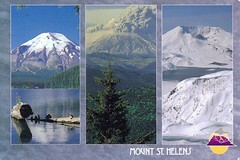 A postcard received via Postcrossing from Mary in Washington State, USA. Mt St Helens is a volcano that errupted in 1980. Mary says she used to swim in the lake on the left as a child when she camped there with her family. Thanks for the lovely postcard, Mary!